We homeschool through a charter school, and the one big hoop we have to jump through to be part of their program is the yearly standardized testing. They try to make it painless and fun, (and quick! 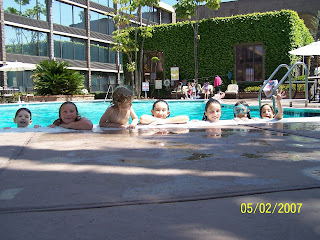 )...so here is a photo of the kids swimming at the hotel-test-site, after the test. Demi is on the left, Meg center, Josie (with goggles) and Amie far right. This was where you would find us on both Tuesday and Wednesday. It was warm and beautiful, I sat with a book and a diet coke. ....I could really dig this.